One of the ways we like to mix up how we design our web sites is that, well, we don’t. You see, we sometimes get our sites designed by others. Gives us a fresh perspective and a different angle we might not have otherwise thought of. One way we get others designing our sites is via design contests over at 99 Designs. Essentially what you do is submit your brief, allocate some prizemoney to the winner and designers submit their entires. What we’ve done is made it a ‘blind’ contest – that is, only I can see the entries. Which means, in theory, that all entries should be fresh because the designers don’t get to see the other entries. 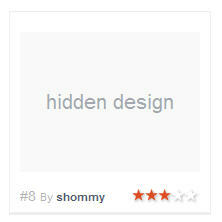 Nice in theory, but in practice it seems to have discouraged the usual decent number of designers entering. But you have to try new things to see how they work. And if they don’t work, you tweak them until they do. If you’re a designer keen to have a crack at a nice $950 US prize, then feel free to check out the contest here.